The review pile here at RFMHQ is a constantly renewing organic structure, a thing of wonky wonder. As I try to scoop and classify I feel like a bowerbird, inebriated and stumbling after pecking too much fermented fruit on the rainforest floor. It’s glorious – to be knee-deep in art is humbling and inspiring. Alas, we can’t cover it all – even with Joe tethered in the basement and being paid by the word in candy floss. This means I have the depressing job of saying ‘no’ to people, usually because the deeply personal vision they have enthusiastically presented has left me cold. Most people take it on the chin like good ‘uns, the no-audience underground seems driven to create and approbation is not necessary, but the process of repeat listens and delicately crafting emails is almost as time-consuming as writing reviews of the (in my opinion) hot stuff. This is why I have been quiet of late: an unlucky run of releases that I ended up saying ‘no’ to took up my available listening time (well, that plus the writer’s block inducing stuff I talked about here – a post that no fucker read because I daftly published it on the day Prince died). I was starting to wonder if it was me – had my glands of musical appreciation atrophied to the point where only a Culveresque rumble would juice ‘em up? Remembering the high quality of the first HRR release (a top ten finish in the 2015 Zellaby Awards), I discretely shuffled it to the top of the pile and, mate, an hour later those glands were secreting all over the place. I needn’t have worried. A split tape (sold out at source, download available), each act filling a side with one twenty-seven and a half minute long track. ‘Radioclast E.R.A. 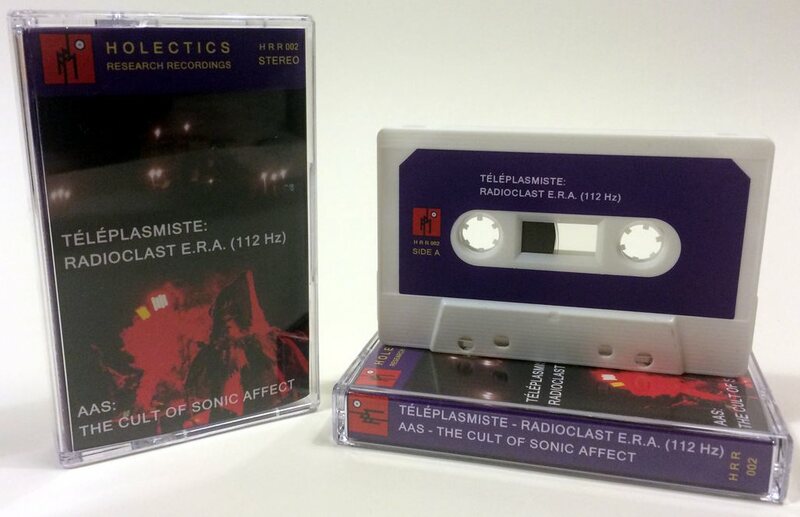 (112 Hz)’ by Téléplasmiste is a profoundly satisfying synth drone (created in part by ‘two identical, extremely rare Fenix II semi-modular synthesisers’ you gear pervs) reminiscent of all your favourite electrokrautpsych. It’s a wonderful, deep pile fuzz to wriggle your toes in. It’s a river mouth of jostling currents, stirring up the silt and causing the flatfish to ripple and groove. It’s that old guy on the bus with the silver topped cane whose aftershave smells of marzipan. It put me in the same mood as buying new pillows, or looking out of the kitchen window at a sunset the colour of ripe peach flesh. These are not trivialities I describe; they are consolations – rewards embedded in the slog of the everyday – and are to be celebrated. Thus I love this track without reservation. Brace yourselves – in order to account for ‘The Cult of Sonic Affect’ by AAS I’m going to have to strip to my underwear and… prod things. As I spread into middle age my hirsute but otherwise immaculate outer shell is becoming more, shall we say, characterful. I’m increasingly adorned with knobbles, spots, skin tags and gristly lumps floating just under my surface. Yes, yes, I know they could all be symptoms of horrific illness that I should get checked out, but for now my denial trumps my hypochondria and I’m not fussed. Indeed, I was happy to joke not long ago that as these features can be grouped into personal constellations and ley-lines maybe they are actually biological pop-studs – press them in a particular sequence and my skin would auto-flay, revealing the robo-lizard that is my true self. I thought this notion hilarious until I had an extraordinary vivid dream (…or was it?!) in which I was abducted by aliens who transferred my brain into a robo-lizard and covered the skin stretched over it with fake moles which were actually biological pop-studs. I woke in a discombobulated state convinced of only one thing: that I had heard the sound of the monstrous laboratory and the throbbing occult-science crescendo of the whole procedure before. It was here. Nefarious, unfathomable and terrifically impressive.